Slow and Glow. Slow aging and increase glow. These are just a few benefits of PRP (Platelet-Rich Plasma Therapy), also known as a Vampire Facelift. 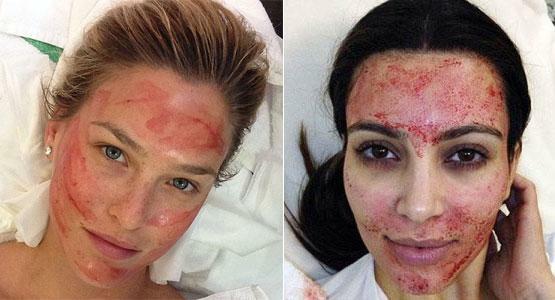 While the photos of this procedure look scary (see supermodel Bar Refaeli and Kim Kardashian immediately following treatment), the procedure is painless, and many of our patient’s aren’t stopping at one treatment—they’re coming back for two, three or four to keep their skin looking young. “PRP (treatment) + Microneedling (delivery method) = true skin regeneration” – Dr. Zheng PRP uses platelet-rich plasma from your own blood. These platelets are rich in growth factors—scientifically proven to help your skin not only look younger, but to behave younger. The plasma is extracted from the blood and injected back into the skin using microneedling. The treatment is painless, and initiates a healing response in the skin to kick-start the regenerative process. EVERYOUNG PATIENT following a series of PRP treatments. Numbing cream is used prior to treatment—making this a painless procedure with a quick recovery time. Redness last 3 days, but makeup can be used on the 2nd day for a quick return to work. Results are visible within days, and will continue to improve as new collagen forms; improving tone and texture and reducing fine lines and imperfections.